Balthazar is the name given to a huge 12 litre bottle of wine (equivalent to 16 ordinary bottles) which would undoubtedly be capable of giving one an extremely sore head and most likely rendering one unconscious. 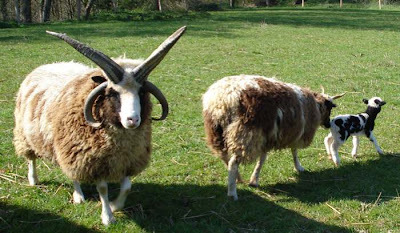 Balthazar is also the name of the huge Jacob ram of a neighbour who is endowed with no less than four horns (see photo) which would also undoubtedly be capable of giving one an extremely sore head and most likely rendering one unconscious. There was a ring of the ship’s bell at the front door the other day and we leaned over the balcony (we live on the first floor of a converted barn) to peer down at Solange, a neighbour, who explained that “le bélier de l’avocat a échappé, which is to say that the lawyer’s ram had escaped, and could I help. I threw a few fencing tools into a wheelbarrow and followed her home. Thankfully, the ram had re-entered the field to rejoin his ewe and lamb and so all that was needed was a secure repair to the fence. Solange had also phoned Paul’s (the pig farmer) house and spoken to Christiane, his wife who had turned up to help, along with her sister Cecile and nephew, Tristan. 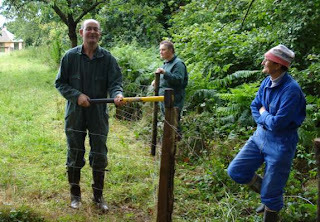 Seeing what was needed to effect the repair, I’d gone off to search for some posts and other tools and returned to find Paul had turned up as well: a right old community get-together in the corner of someone else’s field, with a bemused and (thankfully) benign Balthazar looking on. 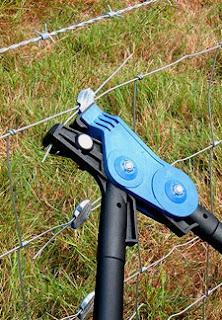 We bashed a couple of extra posts in and while the others were tacking the sheep netting on with fencing staples, I produced a Gripple! Now I have loads of respect for my farming (and other) neighbours and we’re very much the new kids on the block, debutants in almost all we set our minds to, so I find it particularly enjoyable when we raise an inquisitive French eyebrow (or several) as happened with the appearance of the Gripple. It’s the best of British engineering, a really simple idea that just works. You thread two ends of wire through the holes; apply a tensioning tool, squeeze and the job’s done. In this instance, I bashed in one post to act as an anchor and attached it to the loose post at the corner of the field with a single length of wire with a loop at the end, tensioned with the Gripple: Balthazar secure again and headaches, of all sorts, averted. The ram and ewe had arrived courtesy of Marie-Laure’s brother (I think) as an answer to grass cutting. The lamb was a bit of a surprise for them when it arrived and, truth be told, the ram, with his four horns, is a bit of a handful and so is leaving soon—with partner and lamb—for pastures new: a nature park in Normandy, as M-L can’t bear to eat anything she’s known personally.